Dolly Parton Slot Machine : Big Game Money! It's Not Just Nine To Five On The Dolly Parton Slot Machine! Those who love country music are in for a treat with the Dolly Parton slot machine. The many songs that have made this American country singer famous are featured on the game, giving fans exactly the kind of reminiscing that a true fan wants. The game is interactive and allows people to choose which songs they want to hear, making it feel like a real, live performance! It isn't just the music, however, that makes this machine sing. Game developers gave this slot two very distinctive themes. Not only can fans listen to Dolly's music, but they can also watch footages from her famous tours, all viewed in high resolution. Up to 14 hit songs are available and patrons choose what they most want to hear. Wagers start at only 1 cent, allowing for very inexpensive fun while still getting to hear their favourite singer croon. It doesn't just stop at music coming from the speakers. Dolly actually speaks to players when they are playing, adding to the joy of this game. There are five reels and up to 30 paylines. 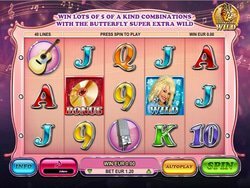 The different themes generate different maximum credits that can be won; 300 credits can be bet on the Dolly Parton slot machine, and only 1500 can be risked on the other themes of Nine to Five and Two Doors Down. The screen is an LED display that lets enthusiasts imagine they are right with the singer. The symbols used represent Dolly herself: her famous guitar, pink shoes, grand piano, microphone and earrings, in addition to a special VIP tour card. The slot offers unique bonus rounds that are sure to entice admirers to come back for more. On Nine to Five there is a Rockin' Reels feature that can be triggered. In the center reel, patrons must accumulate stacked multipliers in order to activate the bonus round. The outer reels, instead, adjust the choice of music. On Two Doors Down, a free bonus round also offers stacked diamond wild cards in addition to concert footage. There is also a Pick Me feature that allows players to pick records at random in order to win additional credits.